How much would you pay for the perfect cup of coffee? Royal Coffee Makers are bringing their bespoke 24K gold brewing machines to the UAE and Saudi Arabia, as the Middle East prepares to spend on the most extravagant coffee makers we’ve ever seen! There is already a demand for the handcrafted makers which use the finest Baccarat crystal, silver, copper and precious stones in their designs, as retail prices start at a huge USD $15,500. Catering for true coffee connoisseurs, Royal Coffee Makers strive to meticulously craft the ultimate cup of coffee, as they ensure perfection at every stage of the brewing process. Sealing aromas and flavours like no other, this coffee maker certainly has to be special to warrant its price tag. However, the Middle East isn’t afraid to spend on luxury items and with a rich history of coffee we’re sure the region will welcome the Royal U.S. brand in the next few months. 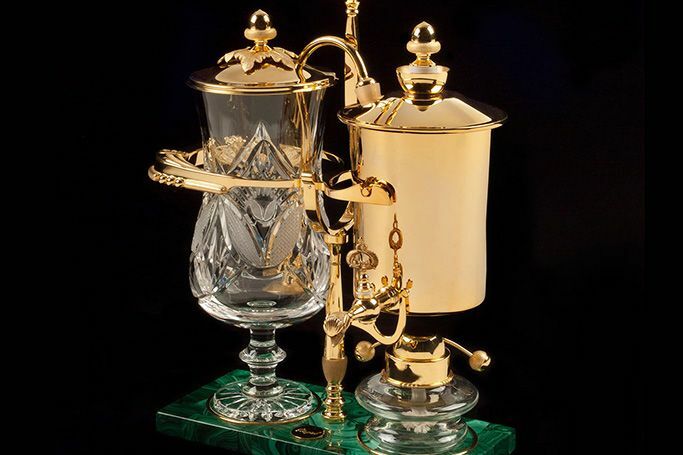 With each coffee maker built by a team of artists, sculptors, metallurgists and engineers, you can’t deny the craftsmanship that goes into making the perfect cup of coffee. Yet, we’re still a little overwhelmed at the world’s most expensive coffee maker which will soon be available in the Middle East, as we don’t think we can afford one anytime soon! © EWModa - All Rights Reserved.